Little is recorded about Philip's childhood and youth, in large part because he was of minor royal birth. Philip's father Charles, Count of Valois, the younger brother of King Philip IV of France, had striven throughout his life to gain a throne for himself but was never successful. He died in 1325, leaving his eldest son Philip as heir to the counties of Anjou, Maine, and Valois. In 1328, Philip's first cousin Charles IV died without a son and with his widow Jeanne d'Évreux pregnant. Philip was one of the two chief claimants to the throne. The other was King Edward III of England, who was the son of Charles's sister Isabella and his closest male relative. The question arose whether Isabella should have been able to transmit a claim that she herself did not possess. The assemblies of the French barons and prelates and the University of Paris decided that males who derive their right to inheritance through their mother should be excluded according to Salic law. As Philip was the eldest grandson of Philip III of France through the male line, he became regent instead of Edward, who was a matrilineal grandson of Philip IV of France and great-grandson of Philip III. During the period in which Charles IV's widow was waiting to deliver her child, Philip rose to the regency with support of the French magnates, following the pattern set up by Philip V's succession over his niece Joan II of Navarre. He formally held the regency from 9 February 1328 until 1 April, when Jeanne d'Évreux gave birth to a girl, named Blanche. Upon this birth, Philip was named king and crowned at the Cathedral in Reims on 29 May 1328. After his elevation to the throne, Philip sent the Abbot of Fécamp, Pierre Roger, to summon Edward III of England to pay homage for the duchy of Aquitaine and Gascony. After a subsequent second summons from Philip, Edward arrived at the Cathedral of Amiens on 6 June 1329 and worded his vows in such a way to cause more disputes in later years. 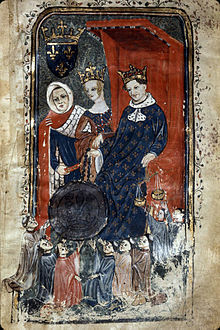 The dynastic change had another consequence: Charles IV had also been King of Navarre, but, unlike the crown of France, the crown of Navarre was not subject to Salic Law. Philip VI was neither an heir nor a descendant of Joan I of Navarre, whose inheritance (the kingdom of Navarre, as well as the counties of Champagne, Troyes, Meaux, and Brie) had been in personal union with the crown of France for almost fifty years and had long been administered by the same royal machinery established by Philip IV, the father of French bureaucracy. These counties were closely entrenched in the economic and administrative entity of the crown lands of France, being located adjacent to Île-de-France. 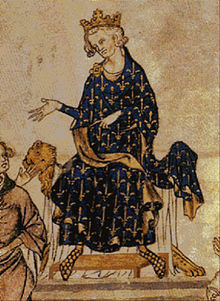 Philip, however, was not entitled to that inheritance; the rightful heiress was the surviving daughter of Louis X, the future Joan II of Navarre, the heir general of Joan I of Navarre. Navarre thus passed to Joan II, with whom Philip struck a deal regarding the counties in Champagne: she received vast lands in Normandy (adjacent to her husband Philip's fief in Évreux) in compensation, and he kept Champagne as part of the French crown lands. 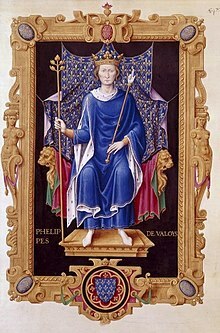 Philip's reign was plagued with crises, although it began with a military success in Flanders at the Battle of Cassel (August 1328), where Philip's forces re-seated Louis I, Count of Flanders, who had been unseated by a popular revolution. Philip's wife, the able Joan the Lame, gave the first of many demonstrations of her competence as regent in his absence. Philip initially enjoyed relatively amicable relations with Edward III, and they planned a crusade together in 1332, which was never executed. However, the status of the Duchy of Aquitaine remained a sore point, and tension increased. Philip provided refuge for David II of Scotland in 1334 and declared himself champion of his interests, which enraged Edward. By 1336, they were enemies, although not yet openly at war. Philip successfully prevented an arrangement between the Avignon papacy and Holy Roman Emperor Louis IV, although in July 1337 Louis concluded an alliance with Edward III. The final breach with England came when Edward offered refuge to Robert III of Artois, formerly one of Philip's trusted advisers, after Robert committed forgery to try to obtain an inheritance. As relations between Philip and Edward worsened, Robert's standing in England strengthened. On 26 December 1336, Philip officially demanded the extradition of Robert to France. On 24 May 1337, Philip declared that Edward had forfeited Aquitaine for disobedience and for sheltering the "king's mortal enemy", Robert of Artois. Thus began the Hundred Years' War, complicated by Edward's renewed claim to the throne of France in retaliation for the forfeiture of Aquitaine. Philip entered the Hundred Years' War in a position of comparative strength. France was richer and more populous than England and was at the height of its medieval glory. The opening stages of the war, accordingly, were largely successful for the French. At sea, French privateers raided and burned towns and shipping all along the southern and southeastern coasts of England. The English made some retaliatory raids, including the burning of a fleet in the harbour of Boulogne-sur-Mer, but the French largely had the upper hand. With his sea power established, Philip gave orders in 1339 to prepare an invasion of England (the Ordinance of Normandy) and began assembling a fleet off the Zeeland coast at Sluys. In June 1340, however, in the bitterly fought Battle of Sluys, the English attacked the port and captured or destroyed the ships there, ending the threat of an invasion. On land, Edward III largely concentrated upon Flanders and the Low Countries, where he had gained allies through diplomacy and bribery. A raid in 1339 (the first chevauchée) into Picardy ended ignominiously when Philip wisely refused to give battle. Edward's slender finances would not permit him to play a waiting game, and he was forced to withdraw into Flanders and return to England to raise more money. In July 1340, Edward returned and mounted the Siege of Tournai. By September 1340, Edward was in financial distress, hardly able to pay or feed his troops, and was open to dialogue. After being at Bouvines for a week, Philip was finally persuaded to send Joan of Valois, Countess of Hainaut to discuss terms to end the siege. On 23 September 1340, a nine-month truce was reached. So far, the war had gone quite well for Philip and the French. While often stereotyped as chivalry-besotten incompetents, Philip and his men had in fact carried out a successful Fabian strategy against the debt-plagued Edward and resisted the chivalric blandishments of single combat or a combat of two hundred knights that he offered. In 1341, the War of the Breton Succession allowed the English to place permanent garrisons in Brittany. However, Philip was still in a commanding position: during negotiations arbitrated by the pope in 1343, he refused Edward's offer to end the war in exchange for the Duchy of Aquitaine in full sovereignty. The next attack came in 1345, when the Earl of Derby overran the Agenais (lost twenty years before in the War of Saint-Sardos) and took Angoulême, while the forces in Brittany under Sir Thomas Dagworth also made gains. The French responded in the spring of 1346 with a massive counter-attack against Aquitaine, where an army under John, Duke of Normandy, besieged Derby at Aiguillon. On the advice of Godfrey Harcourt (like Robert III of Artois, a banished French nobleman), Edward sailed for Normandy instead of Aquitaine. As Harcourt predicted, the Normans were ill-prepared for war, and many of the fighting men were at Aiguillon. Edward sacked and burned the country as he went, taking Caen and advancing as far as Poissy and then retreating before the army Philip had hastily assembled at Paris. Slipping across the Somme, Edward drew up to give battle at Crécy. Close behind him, Philip had planned to halt for the night and reconnoitre the English position before giving battle the next day. However, his troops were disorderly, and the roads were jammed by the rear of the army coming up, and by the local peasantry furiously calling for vengeance on the English. Finding them hopeless to control, he ordered a general attack as evening fell. Thus began the Battle of Crécy. When it was done, the French army had been annihilated and a wounded Philip barely escaped capture. Fortune had turned against the French. The English seized and held the advantage. Normandy called off the siege of Aiguillon and retreated northward, while Sir Thomas Dagworth captured Charles of Blois in Brittany. The English army pulled back from Crécy to mount the siege of Calais; the town held out stubbornly, but the English were determined, and they easily supplied across the English Channel. Philip led out a relieving army in July 1347, but unlike the Siege of Tournai, it was now Edward who had the upper hand. With the plunder of his Norman expedition and the reforms he had executed in his tax system, he could hold to his siege lines and await an attack that Philip dared not deliver. It was Philip who marched away in August, and the city capitulated shortly thereafter. 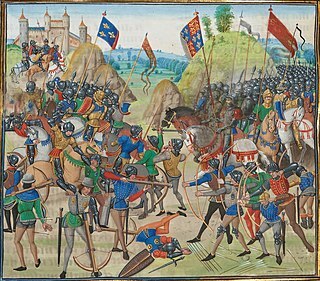 After the defeat at Crécy and loss of Calais, the Estates of France refused to raise money for Philip, halting his plans to counter-attack by invading England. In 1348 the Black Death struck France and in the next few years killed one-third of the population, including Queen Joan. The resulting labour shortage caused inflation to soar, and the king attempted to fix prices, further de-stabilising the country. His second marriage to his son's betrothed Blanche of Navarre alienated his son and many nobles from the king. Philip's last major achievement was the acquisition of the Dauphiné and the territory of Montpellier in the Languedoc in 1349. At his death in 1350, France was very much a divided country filled with social unrest. Philip VI died at Coulombes Abbey, Eure-et-Loir, on 22 August 1350 and is interred with his second wife, Blanche of Navarre, in Saint Denis Basilica, though his viscera were buried separately at the now demolished church of Couvent des Jacobins in Paris. He was succeeded by his first son by Joan of Burgundy, who became John II. In July 1313, Philip married Joan the Lame (French: Jeanne), daughter of Robert II, Duke of Burgundy, and Agnes of France, the youngest daughter of Louis IX. In an ironic twist to his "male" ascendancy to the throne, the intelligent, strong-willed Joan, an able regent of France during the king's long military campaigns, was said to be the brains behind the throne and the real ruler of France. John II (26 April 1319 – 8 April 1364). Marie (1326 – 22 September 1333), who married John of Brabant, the son and heir of John III, Duke of Brabant, but died shortly afterwards. Louis (born and died 17 January 1329). Louis (8 June 1330 – 23 June 1330). A son [John?] (born and died 2 October 1333). A son (28 May 1335), stillborn. Joan (born and died November 1337). A son (born and died summer 1343). Joan (Blanche) (May 1351 – 16 September 1371), who was intended to marry John I of Aragon, but who died during the journey. Philip is a character in Les Rois maudits (The Accursed Kings), a series of French historical novels by Maurice Druon. He was portrayed by Benoît Brione in the 1972 French miniseries adaptation of the series, and by Malik Zidi in the 2005 adaptation. ^ David Nicolle, Crécy 1346: Triumph of the Longbow, (Osprey, 2000), 12. ^ a b Elizabeth Hallam and Judith Everard, Capetian France 987-1328, 2nd edition, (Pearson Education Limited, 2001), 366. ^ a b Jonathan Sumption, The Hundred Years War: Trial by Battle, Vol. I, (Faber & Faber, 1990), 106-107. ^ Viard, "Philippe VI de Valois. Début du règne (février-juillet 1328)", Bibliothèque de l'école des chartes, 95 (1934), 263. ^ Curry, Anne (2003). The Hundred Years' War. New York: Rutledge. p. 18. ^ a b Jonathan Sumption, The Hundred Years War: Trial by Battle, 109-110. ^ Kelly DeVries, Infantry Warfare in the Early Fourteenth Century, (The Boydell Press, 1996), 102. ^ Jonathan Sumption, The Hundred Years War:Trial by Battle, 135. 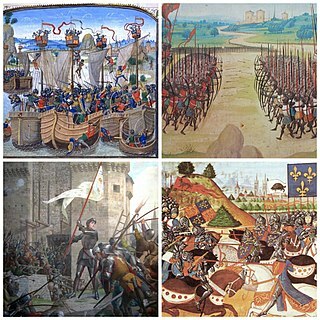 ^ The Hundred Years War:Not One But Many, Kelly DeVries, The Hundred Years War (part II): Different Vistas, ed. L. J. Andrew Villalon, Donald J. Kagay, (Brill, 2008), 15. ^ a b c Jonathan Sumption, The Hundred Years War:Trial by Battle, 171-172. ^ Jonathan Sumption, The Hundred Years War:Trial by Battle, 184. ^ Oars, Sails and Guns:The English and War at Sea, c.1200-1500, Ian Friel, War at Sea in the Middle Ages and the Renaissance, ed. John B. Hattendorf, Richard W. Unger, (The Boydell Press, 2003), 79. ^ a b Jonathan Sumption, The Hundred Years War:Trial by Battle, 320-328. ^ Jonathan Sumption, The Hundred Years War:Trial by Battle, 349. ^ a b c Jonathan Sumption, The Hundred Years War:Trial by Battle, 354-359. ^ Mortimer, Ian (2008). The Perfect King The Life of Edward III, Father of the English Nation. Vintage. p. 276. ^ The kingdom of Burgundy, the lands of the house of Savoy and adjacent territories, Eugene Cox, The New Cambridge Medieval History: Volume 5, c.1198-c.1300, ed. David Abulafia, Rosamond McKitterick, (Cambridge University Press, 1999), 371. ^ Jonathan Sumption, Hundred Years War:Trial by Fire, Vol. II, (University of Pennsylvania Press, 1999), 117. ^ David d'Avray, Papacy, Monarchy and Marriage 860–1600, (Cambridge University Press, 2015), 292. ^ a b Marguerite Keane, Material Culture and Queenship in 14th-century France, (Brill, 2016), 17. ^ Identity Politics and Rulership in France: Female Political Place and the Fraudulent Salic Law in Christine de Pizan and Jean de Montreuil, Sarah Hanley, Changing Identities in Early Modern France, ed. Michael Wolfe, (Duke University Press, 1996), 93 n45. Seward, Desmond (1999). The Hundred Years War. Penguin Books. ISBN 014-02-8361-7. Robert III of Artois was Lord of Conches-en-Ouche, of Domfront, and of Mehun-sur-Yèvre, and in 1309 he received as appanage the county of Beaumont-le-Roger in restitution for the County of Artois, which he claimed. He was also briefly Earl of Richmond in 1341 after the death of John III, Duke of Brittany.